To be fair, before ever playing anything on a Playstation 3 (PS3), I considered the PS3 the devil. I enjoyed the simplicity of Xbox Live and I could find most of the games available on PS3 were available on the 360 as well. All that changed last year when I was introduced to Warhawk. The one thing that really made it interesting to me was it was a multiplayer-only game. It allowed people in the same room to play in a match against people from around the world. In my opinion: the perfect package, albeit with some issues here and there. The graphics in Warhawk were, at the time of it’s release, among the best the PS3 could offer; However, when compared to other games, it just doesn’t have nice realistic smooth look found in games like Gears of War, which was released almost a full year before on a technologically-inferior console. An entirely different matter is the look and feel. 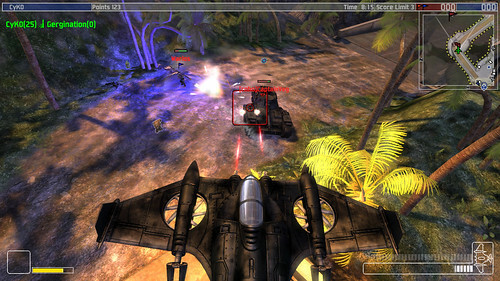 Warhawk forms much of its action and fun by changing the look and feel of the game. For example, you are playing a Capture The Flag (CTF) match on the map and it’s layout is set to full map with full access for ground battle; next map, the layout “Dogfight” is set which forces each team to fight the other in just a Warhawk or Nemesis. With variety in map layouts, 8 maps can become up to 30+ different maps and force the players to change their strategy to the new layout. Sound is one of the most important components to any shooter. Whoever worked on Warhawk‘s sound sure knew that going into production of the game. The sound is absolutely wonderful, both in terms of dimension and just the basics. The sound makes gameplay a whole lot better, because it has a wonderful 3D sound system that just makes the matches all the better. With 3D sound, if you don’t come up quietly your target will know you are there. It also helps in air combat since you can hear the enemy’s engines behind you. In all, the sound totally lends itself to making the matches and game much better. As the picture above illustrates, Warhawk‘s gameplay is far different than most third-person shooters. The best part of the gameplay is it allows you to have three people beside yourself playing in an online match. Weapons used in Warhawk are great as well because every weapon has a counter to it. Even Warhawks can be countered by ground weapons and the reverse is also true, making this one of the most perfect weapon balances ever seen in console video games. However, the game can lag or stutter because it is a multiplayer-only game. If you don’t have a proper network set-up, you could get kicked from a match halfway and lose all progress you were making. If that happens, be sure to check the ports on your router or go to port-forward.com and follow their simple instructions (be sure to look for Playstation Network under your router). The camera angles are almost perfect because it is always focused on you. Wherever you look, the camera always stays looking at you whether you are on the ground or in person. This also means you must be good at turning around fast if you are being chased or else you are dead. Gameplay is really smooth and flows nicely, given how big the maps are and what people are doing at the time. Even if you are on the ground getting chased by a Warhawk, you can enter Warhawk as well and take it to your enemy without so much as a hiccup or stutter. It may take a little while to get your aim speed down, but it won’t take long so it’s hardly noticeable. It can take a match or two to find your balance. Other than that, gameplay is wonderful and just screams for you to play and play a lot. The controls for Warhawk are both a blessing and a curse because while you will have an easy time learning ground combat, it will take a long time (roughly ten matches) before you understand the controls of a Warhawk. A common problem is that people will not learn the Pro Flight mode, which is what 80% of all players use when flying. However, with the recent release of update 1.5, there are two tutorials that will help out greatly. The tutorials are Warhawk Training and Flight Practice. Warhawk Training will help with understanding the basics while Flight Practice will help you practice Pro Flight and various other advanced techniques that will make you a good pilot. Once you have mastered the ground and flight controls, you will be ready to unleash pain on your foes. Warhawk is something of an enigma today. It seems to be as if Incognito took Gears of War and blended it with Star Wars: Rogue Squadron. After all, it has the tactical, team-based gameplay of Gears mixed with the fluid of flying found in Rogue Squadron. The best part is that it is so well blended. By mixing two very different gameplay styles almost perfectly, they created a whole new style that is just fantastic. That is what makes Warhawk so great: it is a representation of mixing two very different styles of combat and tuning them together so well, it is hard to notice them separately. Warhawk has everything you could want in a multiplayer game: great variety, excellent gameplay, good controls, and wonderful sound. Ever since I first played it, I have been hard-pressed to find a better console multiplayer experience. It doesn’t matter whether you are a fan of Madden, Halo, or even Lego Star Wars, this game will appeal to you if you are a fan of great video game multiplayer in general. In all, a great video game that I recommend for owner of a Playstation 3.